Once in a while, since I like doing photography, I do capture things, that I really like when I see them, and when I have a device to capture them. One such time was some time back when I visited Hauz Khas Village, and came back with numerous pictures. I am sharing one of those pics here. More on the visit soon in this very space. I guess, by now, you must be knowing about my rooftop solar power project that has been designed to initially cater to some of the energy requirements in my home. Over the period of time, I have been doing some improvements in the system. Some of these are easy and get completed in hours, or in a maximum, days, while some others are such that they don't really intend to become operational anytime soon. One of these is the online automated monitoring system that has been thought out to be a fully loaded monitoring system with a full array of monitoring and other sensors to help assist the tracking systems. These sensors include atleast two temperature monitoring sensors, one, attached directly to the panels, which will give me the temperature of the module, which, in turn will help me calculate the performance of the modules. Now this is an important aspect of Solar power generation since there's an important aspect of solar power generation called Temperature Coefficient, particularly associated with Polycrystalline solar modules that determines the power a module will generate at it's peak efficiency at a given temperature and irradiance condition. The other temperature and humidity sensor will help me with the ambient air temperature and humidity around the solar installation. Another array of sensors have less to do with monitoring and more to do with the functional aspect of the solar tracker. This is the Light Dependent Resistors, also known as photocells, that help determine the position the solar modules are required to be moved to align them in a near perpendicular position to the sun for the best theoretical efficiency. The output from these sensors too have been planned to be made available in the online monitoring system to see how the system reacts at different times of the day, and varying sunlight conditions. Now comes the other series of sensors - that include a 3-axis digital gyroscope sensor, that will help determine the extreme positions of the system, in order to prevent movement beyond a predetermined limit, and will also help the system realign the panels to two positions - one being perpendicular to the earth's surface, and another being towards the east - facing the sun in the morning, since this will be the period when the photosensors will be practically useless since all of these will be facing towards the sky early in the morning, which will mean that there will be very less comparable difference in the light output at any of these to help the MCU make a decision to move the panels. Another sensor in this series will be a current sensor that will be used to keep a track on the current produced by the solar modules, throughout the day. The data from the current sensor, when combined with a voltage sensor will provide me with crucial information regarding the total output of the system at any given point of time, and also, will help keep a track of the cumulative power generated by the system. Another of these sensors, that is being planned is a wind velocity sensor that will feed in information about the velocity of the winds, which is crucial in order to keep the system secure and relatively safer by lowering the expected wind resistance that an array of solar modules will generate when it directly faces a strong gust of wind. Plans are there to automatically align the modules horizontal to the earth's surface, in the event of a strong gust of wind, or a storm, which usually follows such strong gusts of winds and has a very strong potential to even take away very huge objects. There are a lot of other things that have been planned for the system, including a user interfacing system, composed of manual controls with the help of push button swithches to manually align the panels in case we intend to do this. This is particularly important on days with overcast conditions, with a variying cloud cover which particularly confuses the system. Having an option of manual control of the system will be an added advantage. Now all these things are plans, some of which are underway, and another set of plans are in the pipeline, and will get the attention once these crucial systems are finally completed. 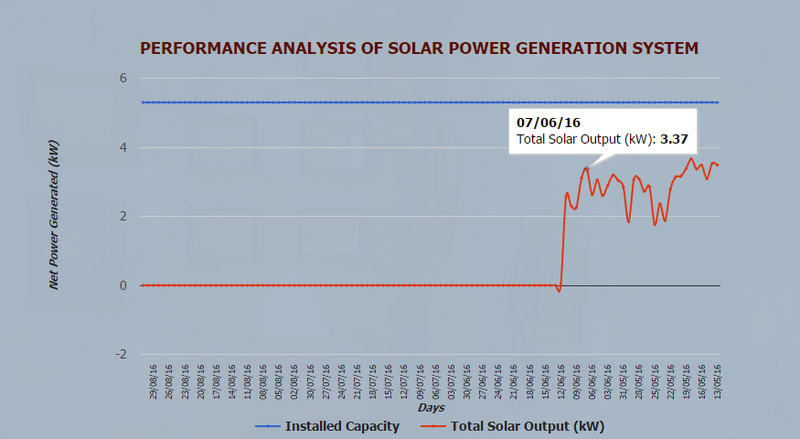 For now, what I have completed is a manual power tracking mechanism which will keep a record of the daily power generation, along with some small comments regarding the performance of the system. A good place for such a monitoring system, appeared to me to be a dedicated page in the blog itself, and hence, I have started updating the the data on a daily basis, that I have been keeping a record of, to record the daily power generation by the system, till the time the automated online monitoring and recording systems don't go live. For now, the mnitoring system includes a line chart that keeps a record of the daily power generation in kW (kiloWatts), and plots this on a line graph according to the date. There's another table in the same page which keeps a daily record of the inbuilt power meter that is available in my MPPT charge controller, that I take a note of, twice a day, in the morning, before the sun is out, and in the evening, when the charge controller transfers the inverter to the mains grid supply. There's a certain amount of erroneous data that is attributed to the solar power, when this is actually being provided by the grid mains. This explains the gaps in the meter readings of evening of the previous day and morning of the current day. Though this is not a very huge gap, when considered for a daily basis, but, it does add up to become a huge number when left unaccounted for, for a long period of time, and hence monitoring and noting down of the meter readings becomes necessary twice a day. The monitoring system that is live on this page - http://www.diaryofatechie.com/p/power-meter.html displays both the aforementioned things - a graph to plot the actual daily power generation, compared to the theoretical (based on STC) power generation value for an average of 10 hours of sunshine for the summer months here in India, though, practically, we get a good 11 hours of sun shine, with one and a half hour included each at dusk and dawn, where the system works at a reduced efficiency because of low solar irradiation at these times. This means here in Delhi, we get the sun working for us at above 80% of its maximum output, for almost 8 hours daily, atleast in the summer months. 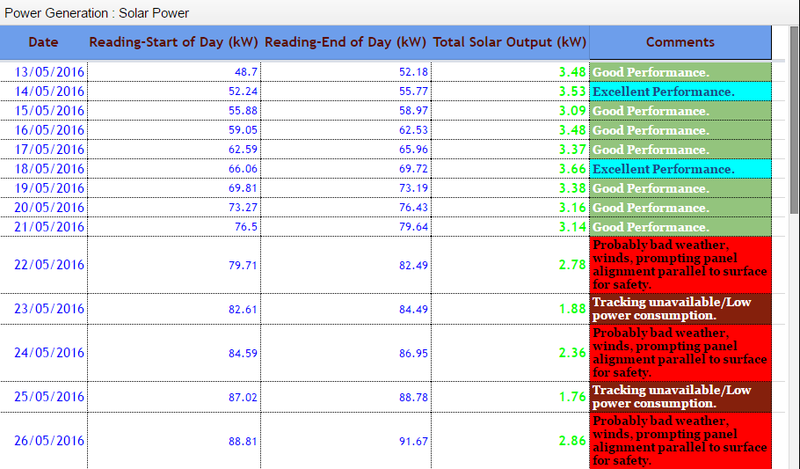 The other section displays a tabular data of the daily power generation - showing the date, meter reading in the morning, and another one in the evening, and the total daily output, and another column containing some comments, which will help myself understand the reason for, say a lower than expected power output for a given day, and a probable reason for this. The tabular display of the daily recorded data showing the day wise meter reading in morning and evening, the total output for the day and comments. This is a small step further. As I keep working on the systems, I will keep you posted here in this space. I know that you have a lot of questions. Do let me know here, in the comments section, and I will try to respond to, as soon as possible. Together, we could increase this breed of DIY'ers.